When breaks lead to breakthroughs — Centered Presence, LTD. I used to think I was really good with my hands. Then something happened that made me even better with them. About two months ago, I fell and broke the radial bone in my left wrist. Recovery required immobilization in a cast for 4 weeks and further rehabilitation for 1-2 months. As a massage therapist and a yoga instructor, I make my living primarily through my hands. This was not an ideal situation, as you might imagine. With this new challenge, my inner fire ignited and burned intensely. I was super motivated to promote the healing process, regain functioning, and get back to full capacity as soon as possible. But no process can be rushed. The mantra that I created, "all processes manifest at the ready time," was not only true, but helped me sustain patience. During recovery, I adapted by doing on-site chair massage with one hand and two elbows; I taught yoga and modeled the poses with modifications that suited me, while guiding students in their appropriate expressions. The biggest shift in my work though was boldly sharing the things that helped me become a Centered Presence in the first place: guided relaxation and self-care practices. I introduced clients to my elevating ways and they benefited greatly. When the cast was removed, I became engaged in some intensive self-care practices of my own -- Occupational Therapy (OT). I dedicated myself to doing the prescribed exercises daily, sometimes 2-3 hours a day. I used the body awareness that I gained over the years as a massage therapist and a yogi to determine just what my body needed at that moment: to forge ahead or to rest. Momentary self-reflection and assessment is the heart of self-care. With a self-care mindset, I found myself doing extra stretches and expanding movements because it felt natural and exactly what I needed. I regained my range of motion and flexibility at an astonishing rate. Within three weeks, movement of my left wrist was the same as the right or within normal limits. My occupational therapist was blown away, but I wasn't. I knew the power of body awareness and self-care. Chinese Therapy Balls (Baoding Balls) were one of my additions. 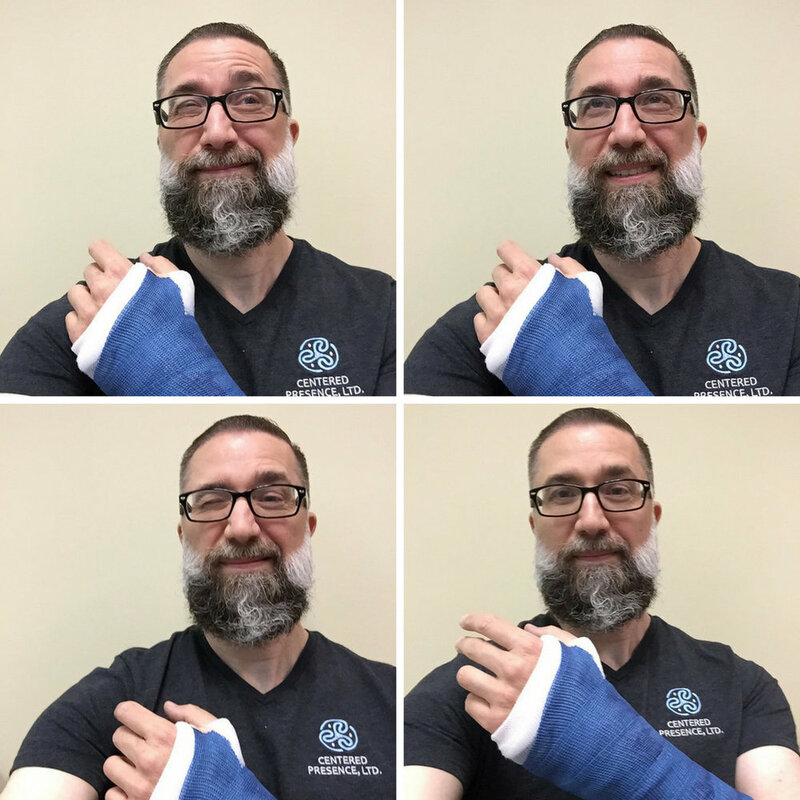 I wanted to regain strength and dexterity in my left hand, so I concluded my regularly prescribed OT exercises by working with them for a few minutes. Rolling the balls around in the hand is like weight lifting for the fingers. It takes coordination, strength and focus. Within two weeks, the ability to rotate them with my recovering, left hand surpassed that of my right, dominant hand. Immediately, I started working the right hand to catch up! 10 days after I began using the balls, I recorded this video. Turn up the volume, so you can hear the lovely sound of progress. I'm happy to say that I've fully recovered and am back to doing on-site table massage, planks, push-ups, and just about everything else that requires a strong, functioning wrist! I am so grateful to be back working with such enthusiastic people! I'm currently scheduling On-Site Table Massages. I am looking forward to more sessions with established clients and taking on some new ones. If you've never had a massage from me or it has been a while, what are you waiting for? I am better than I have ever been. My inner fire is burning stronger than it ever has!